The first criteria Section 8 will look at, is whether you meet HUD's definition of family. HUD has established general guidelines as to what can be considered a family, but has given each Public Housing Authority, or PHA, some flexibility in their exact definition of a family. To determine the exact requirements in your area, you should contact your local PHA. Where at least one individual is over the age of 62. Where one or more individuals in the household have a disability. That has been displaced from their home. This could have happened due to a government action or due to damage or complete destruction caused by a natural disaster or other federally recognized disaster. A tenant who remains in a unit after all other members of his or her family have left the unit. The family was already receiving Section 8. A single person who does not meet any of the above criteria. Section 8 is a program designed to help lower-income individuals afford housing. Therefore, to qualify for a housing choice voucher, a family’s yearly income must be below a certain amount. Each year, HUD sets income limits. These income requirements are broken down into three categories, extremely low income, very low income and low income. These levels differ based on the area, because they are calculated as a percentage of the area’s median income level. Extremely Low Income- 30 percent of the area’s median income level. Very Low Income- 50 percent of the area’s median income level. Low Income- 80 percent of the area’s median income level. The income limits will also differ based on the number of people in the family. Income limits are created for families containing anywhere from one individual to families containing eight individuals. Extremely low-income for a family of one may be $15,000 a year, but for a family of eight, an extremely low-income level may be $30,000 a year. HUD grants priority for Section 8 vouchers to those who would be classified as extremely low-income levels and then to those with very low-income. There are certain circumstances which would allow a family with a low-income status to be granted a Section 8 voucher. The PHA would usually make this decision, but reasons could include those who are classified as “continuously assisted” by public housing programs or those who are in HUD-assisted home ownership programs. Additional sources of income and exclusions from income can be viewed in Exhibit 5-2 of HUD’s Housing Choice Voucher Guidebook. Section 8 vouchers will only be granted to American citizens or to those who have eligible immigrant status. To determine if you have eligible immigrant status, please consult Exhibit 5-1 in HUD’s Housing Choice Voucher Guidebook. Make you sign a declaration stating that you and all members of your “family” are American citizens. Certain PHA’s will also verify each individual’s citizen status by requesting a U.S. passport, social security card or other documentation. Make you sign a declaration stating that you have eligible immigration status. Have you provide INS Documents which prove your immigration status. Verify your information with the INS. Have you sign a form consenting to their use of the information obtained. Families that are made up of individuals who are not American citizens or do not have eligible immigrant status can still be granted housing assistance. However, the amount they will receive will be based on the percentage of family members who are eligible for housing assistance. Has been evicted from a property within the last three years for drug-related criminal activity. Has been convicted of producing methamphetamine in an assisted housing project. 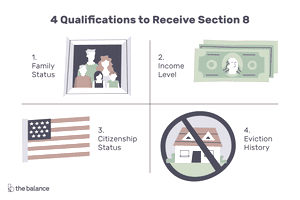 Do You Have to Meet All 4 Criteria to Qualify for Section 8? Individuals who do not meet or consent to the requirements of the above four criteria are not eligible to receive a Section 8 voucher. In addition, each PHA must have laws which govern family obligations. Even if a family meets the above four criteria, housing vouchers can be denied if the family has violated any of these family obligations. For a list of family obligations, please see Exhibit 5-4 of HUD’s Housing Choice Voucher Guidebook.